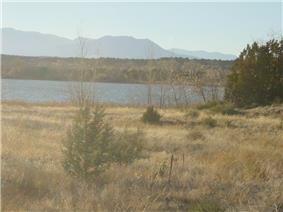 Lathrop State Park is a Colorado state park located 3 miles (4.8 km) west of Walsenburg. The state purchased the property in 1962 and opened Colorado's first state park here later that same year. It is named after Harold Lathrop, the first director of state parks. The park features two lakes, Martin Lake and Horseshoe Lake, that offer fishing for tiger muskie (46-inch, 25-pound examples have been caught here), rainbow trout, bass, catfish, northern pike, blue gill, saugeye, and wipers. The park also offers a beach, boating, water skiing, wind surfing, jet skiing, picnicking, hiking, wildlife viewing, camping, and a nine-hole golf course. Lathrop is the only Colorado state park with its own golf course. The Walsenburg Golf Course was founded in 1965 and after two years of construction opened in 1967. It was built by 50 Walsenburg citizens and many local volunteers in a public/private partnership. The course's restaurant/lounge overlooks the lakes and the National Natural Landmark Spanish Peaks. Over 150,000 visitors passed through Lathrop State Park in the last year for which figures are available. ^ a b Christofferson, Nancy (June 30, 2011). "Golfing in the ‘burg, 1930 on". Huerfano World Journal. Retrieved May 31, 2013. ^ "Lathrop State Park History". Colorado Parks and Wildlife. Colorado Department of Natural Resources. Retrieved May 31, 2013. ^ "Fishing at Lathrop State Park". Colorado Parks and Wildlife. Colorado Department of Natural Resources. Retrieved May 31, 2013. ^ "Activities at Lathrop". Colorado Parks and Wildlife. Colorado Department of Natural Resources. Retrieved May 31, 2013. ^ "Lathrop State Park". Colorado Parks and Wildlife. Colorado Department of Natural Resources. Retrieved May 31, 2013. ^ "Lathrop State Park: FY 06-07 Fact Sheet". Colorado Parks and Wildlife. Colorado Department of Natural Resources. Retrieved May 31, 2013.